The debate over knife control has taken on a new sense of urgency in the United Kingdom after news of London's murder rate spiking to record levels broke last week. In the wake of London's murder rate surpassing that of New York City for the first time, Mayor Sadiq Khan announced new knife-control initiatives in the city. He said London would increase police patrols, grant extra stop and search powers to police on certain patrols, and increase efforts to take people out of gangs by giving them job training. He reiterated the city's position that there is no need for anyone to carry a knife. "No excuses: there is never a reason to carry a knife," Sadiq Khan said on Twitter. "Anyone who does will be caught, and they will feel the full force of the law." Murders in the city have increased over the past year, and criminal knife use has been identified as a major contributing factor. Both gun crime and knife crime saw dramatic increases between fiscal year 2015/2016 and fiscal year 2016/2017, according to statistics released by the Metropolitan Police. 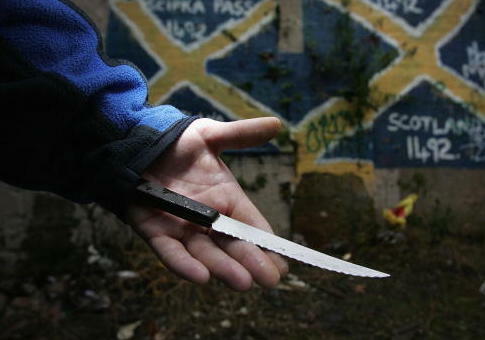 Knife crime saw a 24 percent increase with a 20.5 percent increase in stabbings. Gun crime saw a 42 percent increase with a 57 percent increase in armed robberies. The police have been actively engaged in anti-knife crime Operation Sceptre since July 2015. The operation has resulted in "2,294 arrests, 473 of which were for possession of a knife or weapon and the recovery and removal of 1,435 weapons from the streets of London" using a combination of weapons sweeps and sting tactics, police say. The operation is also partnering with a local charity on a drive to get people to anonymously turn in their knives at police stations or at 30 knife surrender bins located throughout London. "You might be carrying a knife as you are worried that someone is after you and you might want to protect yourself," Detective Chief Superintendent Mick Duthie said in a public letter. "But that is not the way to go about it." Piers Morgan, British media figure and gun-control activist, called for Britain to enact new measures to tighten its knife laws in response to the recent rash of violence. "Britain will definitely toughen knife laws, yes," he tweeted at Parkland survivor Kyle Kashuv. "And we certainly won't arm everyone with a knife to curb knife crime—because that would be insane, right?" He went on to say that Britain will somehow make it harder for criminals to attack people with knives but would not consider arming British civilians. "What would be truly ‘disgusting' is to think the answer to rising knife crime is to arm everyone with a knife," he said. "Britain's response will be to make it harder for criminals to use knives to attack people, not to do nothing or make it easier." Calls for new knife-control measures have increased in recent years with some calling for an outright ban on the ownership of certain kitchen knives. Dr. John Crichton, chairman of the Royal College of Psychiatrists in Scotland, made news in August when he called for those in the United Kingdom to surrender their chef's knives and other kitchen cutlery. "This is a public health measure and public health measures are always about society deciding on a self-imposed restriction for the public good," Dr. Crichton told The Express. "We are very quick to be critical of our American cousins and the prevalence of guns but this is an issue which doesn't even occur to us." He suggested that people could instead use kitchen knives with a curved point. "Why do we need these potentially deadly weapons in the home?" he said. In America, gun-rights advocates pointed to the rising murder rate in London and the subsequent debate over knife control as an example of how the country's near ban on civilian gun ownership has failed. "Our friends in the United Kingdom suffer under horribly restrictive gun laws, yet the murders in London reveal something anti-gunners everywhere refuse to acknowledge," Alan Gottlieb, founder of the Second Amendment Foundation and chairman of the Citizens Committee for the Right to Keep and Bear Arms, told the Washington Free Beacon. "While the British have campaigned for people to turn in knives, it's clear from the body count in their capital city that their outlaws are just like American criminals. They do not obey the laws against guns, knives, or murder and mayhem. "And that is the dirty little secret of gun control. Criminals always find a way to violate the law." Instead of calling for new knife-control measures in the United Kingdom, Gottlieb said the country should "admit their failures." "The time has come for authorities on both sides of the Atlantic to admit that their decades-old campaigns of citizen disarmament have created an environment where criminals thrive," Gottlieb said. "Sadly, the people responsible for these restrictions, which penalize honest citizens, are just too cowardly to admit their failures. Instead, they hide behind the empty promises of new restrictions which won't work any better than the old restrictions." This entry was posted in Issues and tagged London. Bookmark the permalink.